Jen's stuck at a Dr. appt - now there's a fun way to spend New Year's Eve! - she just asked me to let you know that as soon as they get it in gear and let her out of there, she'll be posting, but in the meantime - here's MY ring entry! Where's yours? Jen's running late - so you could still send it to her. For those of you still on vacation, and have a bit of time make up a ring today at some point, and send me a pic before 8am EST tomorrow morning. Changing the World - One loop at a time! Hot d4mn! The feedback that we're getting on our rapid loops is that you love it! Jen used it last night in her inspiration, I was talking to Stephanie Dixon last night, and she's all excited about it - it really is a fast way to make surprisingly great loops! If you find that the headpin is starting to wind around the end of the pliers as you wrap - just a little change in the angle that you grab the headpin at with the pliers can make all the difference. Just experiment a little with each one you do, until you find the "sweet spot." Cool Tools to Make Designing with Hot Fix Rhinestones Fast and Easy and Fun, Fun, Fun. I know, I know - rhinestones aren't exactly beads - but by now, you've probably figured out that the bling is the thing, and so long as it sparkles - it's fair game. First - let's clarify some terminology. Rhinestones can fall into two categories - those with a pointed back, and those with a flat back. Pointed back stones need to go into some sort of setting or mount, whereas flat backs can be glued to any reasonably flattish surface that you can get a glue to stick to. 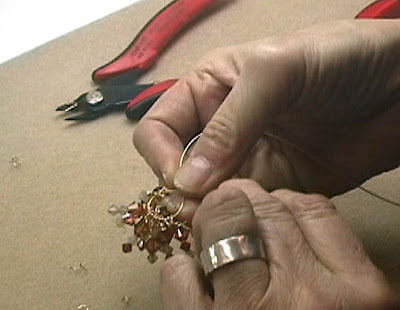 Swarovski makes a plain, flat back rhinestone, but, because a lot of time what you want to do with rhinestones is embellish clothing with them, they also make them with a heat-sensitive glue already applied to the backs. These are called Hot Fix rhinestones. Swarovski has put a lot of research into this glue - as they realize that if folks aren't 100% confident that the glue is going to work, they won't buy the stones. They are fanatical about their glue. Evangelical about it, even. And, I have to say, when properly applied to an appropriate surface - they are as permanent as you could want. We have staff t-shirts that have been through 100s of wash and dry cycles and they are fine - the stones as bright as the day they were applied. And still in place. We've spent some time finding some tools that make designing with the hot-fix rhinestones easy and intuitive. You can use a Be-Jeweler to apply the stone individually. A Be-Jeweler resembles a modified soldering iron. With some practice, you can get good at applying the stones with it. But it's not my favorite way to roll. No - what I wanted was some way to design motifs and patterns intuitively, but without commitment. If you've ever tried arranging rhinestones on a sheet of paper to see how they will look - you quickly realize what an exercise in frustration it is. They slither around, and flip over and move if a moth breathes on them. No - what I needed was some way to have them stay in position. And to then be able to pick them up and transfer them, pattern intact, to the garment in question. First Cool Tool - the Magical Rhinestone Tray. One of the main annoyances is that the stones are top heavy, and flip up-side-down if a mouse farts. This small, plastic triangular tray has tiny bumps in the bottom, and when you gently agitate the tray from side to side, the stones catch on the bumps and flip right side up. It's quite brilliant, actually. This will save you a lot of aggravation flipping stones over. Just pour a few into the tray, shake. Use the flipped ones, when you run out - shake again, and flip more. Totally worthwhile tool. Next, totally cool - the Tacky Mat and the Magical Pick. The Magical Pick is a handle, sort of like a very slender chopstick, with a slightly sticky end. Press it down onto the right-side-up of a rhinestone, and it picks up and comes away on the end of the pick. However, the tacky mat is stickier, so when you place the stone onto the mat - it pulls away from the pick, and stays there. You can also use a lump of natural bees' wax on the end of a bamboo skewer to pick up the stones. I use both. I find that the magical pick doesn't have the holding power for the very big stones that the beeswax does - but the beeswax has the disadvantage of losing it's stickiness if it gets cold - meaning that you need to warm it up in your hand or near a light in the winter for it to work. The magical pick is always good to go - and is fine for the normal sized stones. It's also useful to have a pair of tweezers handy for moving any stones that you need to reposition. Here, you can see the pattern developing as I go. Till finally - I ran out of mat. The tacky mat is 4 x 4 inches - so larger motifs will require to be done in stages, or using more mats. Now - getting the pattern off the mat and onto the fabric. Next, you will need Silicone Transfer Paper. This is a clear, adhesive sheet that comes with a protective backing. Cut a piece the size of the design - with a little extra room, but not much. Separate the backing from the clear front - this may be the hardest part of the whole procedure. Try curling the sheet forwards with the tweezers, hopefully you can get enough of a gap to peel the backing off. Keep the backing. Lay the clear, adhesive sheet down over the pattern and rub lightly but firmly to press onto the stones and adhere them to the transfer sheet. Carefully and slowly peel up the mat, making sure all the stones transfer to the silicone sheet and stay in position. The completed, transferred, design, from the back. Unless you are putting this directly onto the fabric for transfer, put the backing sheet on. This is secure enough that you can pick it up, not even having to keep it level. You can move it around, put it aside while you make another, wait until you are ready to transfer a whole bunch at once. Here's a little pinwheel design, still on the tacky mat. It's easy to design freehand, or work over a design that is under the transparent tacky mat. You can see the colours as you are working with them, and if you change your mind, you can start over. No fear of commitment! And the same design, on the transfer paper. When you go to apply the design to your fabric - you simply take off the white backing sheet and place your transfer in position, glue side down and stones facing up, and heat with an iron or a heat press. When you have finished heating, you peel the transfer paper up from a corner, carefully, making sure all the stones have adhered properly. Here's cute little pony motif, applied to fabric. I'll go more into the specifics of heat and timing next Monday. In the meantime, check out tomorrow's inspiration for details on the stones used and a helpful grid to make designing a rhinestone snowflake easy - and addictive. Here are links to the tools mentioned above. As I sit here relaxing on Boxing Day. I have decided to share my fun and fabulous stacking ring over the past few months that I managed to fire and polish for the Holidays. It was project that I had on the go for a while. I made a very wide band ring, let it dry partially and then cut it in half to make the two rings. Then I let it dry complete and added the adornments. This ring's adornments interlock which makes for an interesting ring (in my opinion). The outer portion is a domed circle with a cutout. The cutout from the center was domed and added to the second ring. A lab created Sapphire was added in the middle. I am happy with how it sits on my hand. I am a fan of big rings but usually the ones I choose stick up and catch. This one although bit has a nice profile and is very wearable. It also can be worn as two separate rings. Balance is very important in life, especially when you're working on a small crafty business that you just LOVE so much! Or when it's full-time. Your crafty business will begin to take over your life. Sometimes you just have to stop. And today is one of those days. It's Christmas Day people, why are you reading a business blog? Put down the mouse. Pour yourself a glass of holiday cheer, serve up a wedge of cake or a plate of cookies and relax. Have a fabulous holiday. You deserve it. 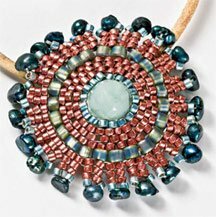 Beading Daily - Free Projects Galore! I recently revisited Beading Daily and I'm glad I did! The site is run by Interweave Press, the publishers behind Beadwork, Stringing, and Step by Step Wire among others. I was perusing their free projects looking for some ideas to work on over the holidays. There are a ton of interesting projects - including some that may be new to you. You will have to join in order to view the free projects (give your email addy). Be sure to check out the sister site Jewelry Making Daily for more projects. I have a few announcements about the new year. Stephanie Dixon is back. So, for everyone out there who has been itching to take her wire crochet and wire lace classes, now you can! Stephanie also has a few new classes. I won't spoil it, but they're pretty little dainty things (duh). Lampworking artist, Lezlie Winemaker, is also returning to teach a few lampwork beadmaking classes in January and February. We've taught you simple loops, and wrapped loops. And now, we're going to show you ... Rapid Loops. Or, you too can make 14 wrapped loops in 6 mins. Or 50 in half an hour! There are some applications where lots of beads hanging together just look fabulous - but making those dangles and loops can be tedious. First - let me back up a little. Last week, we had our pre-Christmas staff dinner. All the crazy bead ladies in one room! With Chocolate, and Lychee Martinis. We just want to say to you - anything can be an earring. Making your own ornament-inspired, but slightly more wearable earrings is a snap. Yep - you can't turn your head wearing those. You'd hurt yourself. I actually came up with this method of "quick and dirty" wrapped loops - Rapid Loops - as an act of desperation, when I realized I had committed to making about 250 wrapped loops in a couple of hours. I thought - "you know - the wrap doesn't have to be perfect if it's not going to be seen ... ."
But you know what? - for all of that - the wraps and loops actually come out pretty even - warp speed wrapping notwithstanding. The basic idea is to pre-load all the headpins (don't bend them, leave them straight), then pick them up and hold them slightly above the top bead. Use Round nose pliers or the small bail making pliers for this. Grasp the very end of the headpin firmly - keeping tension on the headpin, and pull down and to the right, winding around the headpin, going around the back and continuing to wind around and around, no stopping. So here's the video. Now, the person in the video is starting from scratch - she has never made loops this way before. Notice how she picks up speed and gets more comfortable as she goes? 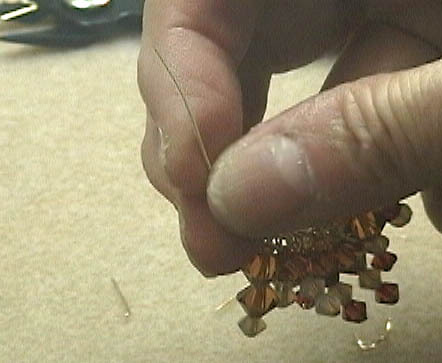 It helps to grasp as close to the end of the headpin as possible. Sometimes the end of the wire breaks off in the pliers. Don't worry about it. Sometimes you find yourself getting the wire wrapped around the pliers - if this keeps happening, change the angle that you are grabbing the headpin at the tip to have the pliers and the headpin form more of a straight line. And - here's the finished loops. Actually not that bad, eh? I've seen worse published in magazines as being done by professionals! Note - they don't all match. The randomness improves the final look. Do the Rapid Loop for all of them. Then trim the end piece of wire. ... and put each half on a jump ring. Then just hang on an earwire. Then knot the Softflex (or beading cable) back on itself, pulling the dangles up into a ball. 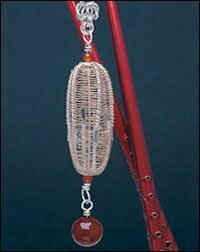 Make a loop in the end of the cable, use a crimp to secure, and hang as earrings. There you have it. Go forth and make Rapid Loops! Hang dangles off of everything! Oprah has her favorite things for Christmas which she shares with her audience. Unfortunately I am not so affluent so I willl share with you my favorite Free resources instead. The internet has a plethora of resources on any topic and there are many many resources out there for the metal clay artist. Metal Clay Today is a free online magazine you can subscribe to. Metal Clay Academy is a central online resource of Resources!!! It has tons of information and will refer you to many other online sources. There are many many other resources but these are a few of my favorite. If you have any you want to share please do. The last of my online orders are out the door, the phone is quiet, the sales season is winding down. Of course at the same time I’m realizing that hey, Christmas is next week and I need to shop! With business slowing down I can focus on personal for now. Or can I? The answer is yes and no. Yes I can take some personal time however I cannot just drop all business matters just because I have no sales. It’s very tempting when business is slow to let it drift, after all there’s no sales happening and there’s cookies to bake! Even though I may not be selling or making anything right now I still have to put some work in. Back in August when sales were slow we focussed on working on our business instead of in it. Now it’s time to do that again. With 13 days left in the year I have one major business task left on my list for 2010, my annual review. My review is not just how I functioned in my “job”, or how well the company did, it’s also about setting goals and milestones for the upcoming year. No matter how small your company is I think a review is critical to your future. A review allows you to see exactly where you are now so that you can map out how to get where you want to go. What went well in 2010? Once I’ve completed my review my calendar with milestones is put on my wall where I can see it. I also enter these into my online calendar so that deadlines (like show application dates and class enrolment dates) don’t pass by. Heh - My special edition really means I have nothing this week for you. :-) I have been busy, and working on gifts - including an all nighter last night to get my kids treasure boxes made. Unfortunately, no picture as my card reader as gone awol. But basically, I've got a total of 6 stacking paper mache boxes. 3 for each girl. I downloaded some digital scrapbooking kits, and printed out paper, and other elements which are then modpodged onto the boxes. I'll embellish further with some hot fix swarovski's. I still need to pick up some hotfix stones, and I'll take some pics once they're done. As you can surmise from the title, I'm still thinking about Zentangle's, and more specifically how to incorporate Zentangles into jewellery. I've made a little rule for myself - mainly to keep me in check. I will only invest time into a new craft if I can possibly incorporate it into my jewellery somehow. Yes, lots of ideas we're floating around my head last night preventing me from getting a decent nights sleep! First we have the obvious (at least to me, and anyone who works with polymer, or metal clay). 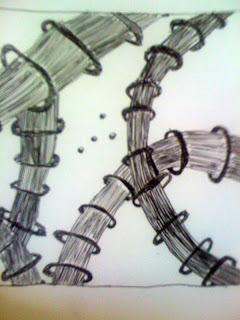 Zentangles are line drawings. They would translate very well into stamps, or texture tiles. 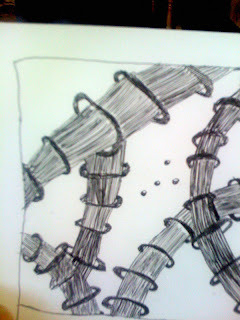 You could also draw your tangles directly onto an object, and then seal it. Using an image transfer medium you could transfer it onto metal, or polymer. You could draw out Zentangles, then scan and reduce the image to use with the glass tiles! In the same vein, shrink your images down to fit in bezels, and pour resin on top. A great one for the kids - have them draw directly on shrinky dink paper, punch holes, and string them up as a pendant. Kids will have an easier time drawing on a larger scale in any case. I've gone ahead and ordered myself a Christmas present! Unfortunately, I think I ordered it a bit late, and it's arrival prior to next Friday is unlikely. Quite a while back, I first heard of Zentangle I think through Sue Henry at one of our Metal Clay playdays. In any case, I thought it was kinda neat, but I certainly didn't have time to start playing with something else. Since then, I've seen a ton of references to the kit online through artists blogs. It was time! So what is a Zentagle exactly? Basically, in it's most simplistic - it's doodling. We all doodle to an extent, some more than others I imagine. Are you once of those people that doodles on your note pad during meetings, or while chatting on the phone? 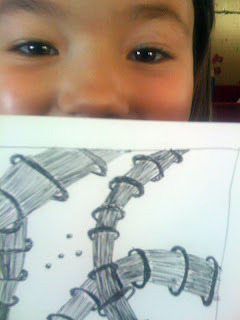 I am - I can usually barely make out my notes from all of the various little eyes and curlicues all over the notes. From their website: Zentangle is an easy to learn method of creating beautiful images from repetitive patterns. It is a fascinating new art form that is fun and relaxing. It increases focus and creativity. Zentangle provides artistic satisfaction and an increased sense of personal well being. 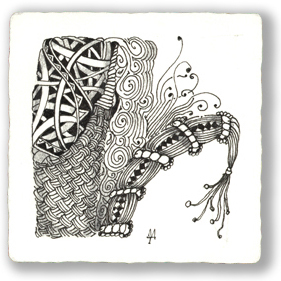 Google Zentangle - follow the links, check out the blogs. There is some really cool stuff out there. Personally, I'm outta here to get myself a good technical pen. I don't think I can wait for the kit to arrive! My Daughter Maya is going to love this as well. This weekend ends our class calendar for the year. The Parent/Child Metal Clay Class is on Sat December 18th. In this class, you and your child can learn to work with metal clay and make beautiful pieces of jewellery in a relaxed and fun environment. 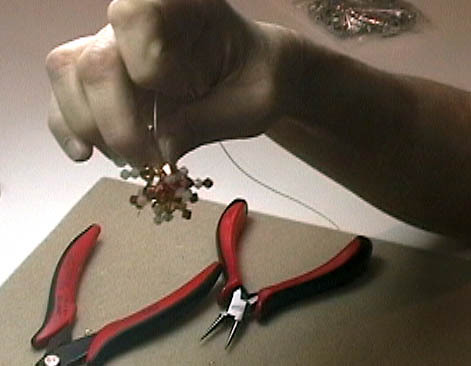 Also on Saturday and Sunday, December 18 and 19th, Learn to Make Glass Beads with Amy Waldman-Smith. This is an 8-hour introduction to lampworking. 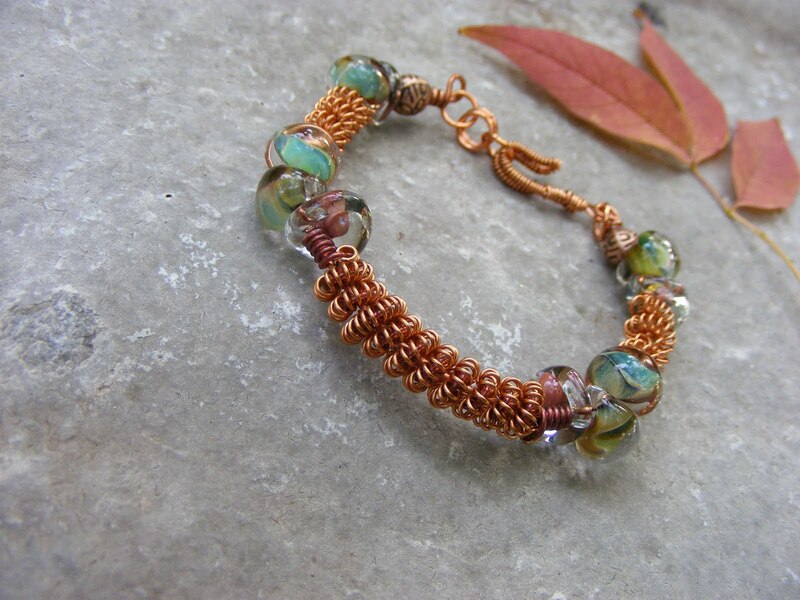 You'll learn the basics of working with glass and how to make gorgeous beads out of them. That wraps it up for the year. It's been fun! Check out the classes coming up in the new year. Inspiration Friday coming up tonight!